The terraced, seaside villages of Cinque Terre offer some of the best hiking in all of Italy. The region has an extensive network of footpaths that connect each of the five villages to one another. 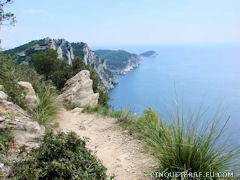 Some Cinque Terre hiking trails are tiring and difficult, while others are suitable for nearly everyone. In Italian a trail is called a sentiero. The high path Sentiero no. 1 is an old mule-track, perhaps dating back to Roman times, which runs along the ridge which separates the coast from the hinterland. The famous Sentiero no. 2 or Sentiero Azzurro connects the five villages of the Cinque Terre and is about 11 kilometers long and takes an estimated 5 hours to walk. There is a total elevation difference of 500 meters between the highest and lowest points of the trail. Walking through the Cinque Terre National Park, you will discover the coastline as well as the backcountry: villages that cling to the cliffs, tiny sandy beaches and sandy coves as well as terraced fields and extensive woodlands. Follow the paths through groves of chestnut, pine, olive trees and wine yards. Enjoy the spectacular views of the sea and the entire coastline.